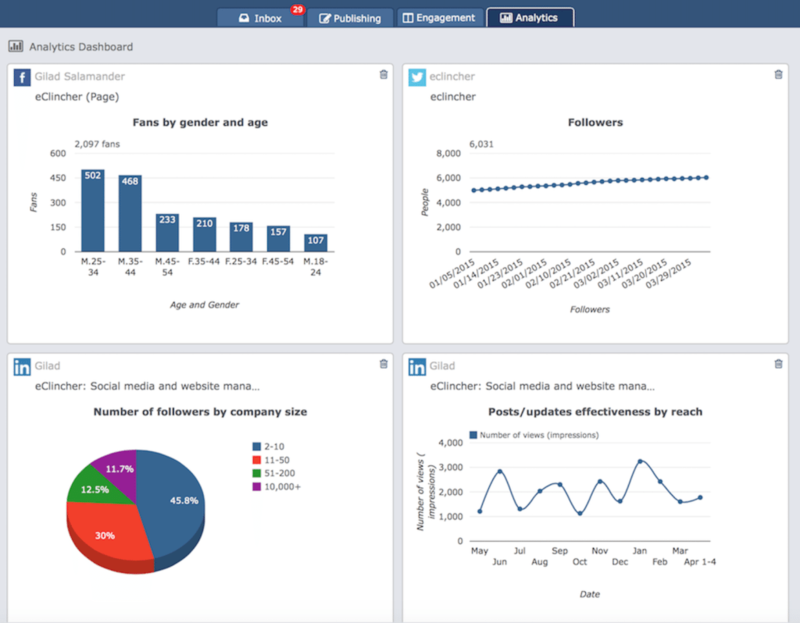 EClincher is social media management software targeted at the everyday user and small-business owner. Canva integration. I reviewed Canva a couple of months ago. The easy, powerful digital media creator is accessible directly within eClincher for the building and dissemination of custom photo posts, banners, text graphics and online promotions. It’s presented directly within the context of a new post. Highly efficient. Inbox. EClincher’s Inbox, available with Basic and Premier plans, silos your social media mentions, retweets, shares and direct messages. It can be filtered by a number of parameters, such as social network, custom tag or account. It also functions as a task list, reminding users which direct interactions require response. 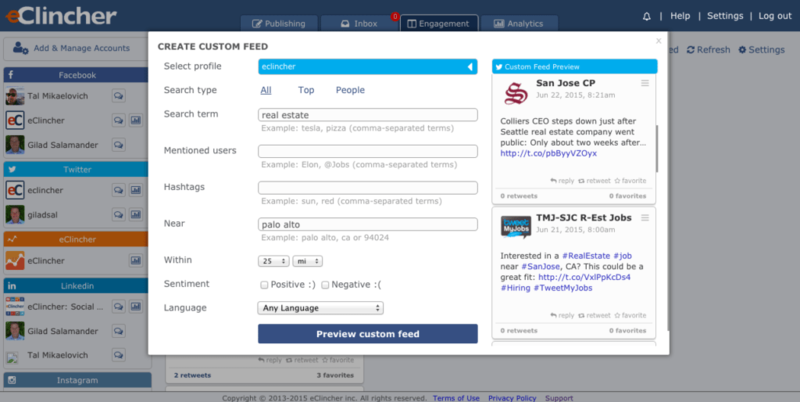 Custom feeds. Agents can create a custom social media filter to monitor instances of competitors being mentioned, or how popular a new home community may be. Using the results of this perpetual intelligence feed, you can find new prospects, aggregate content for sharing and discover new reasons to contact prospects. Overadoption: EClincher is easy to use and as powerful as many of the marketing agency-targeted solutions on the market. The potential is there to overwhelm casual schedulers. However, that is the case with most social media oversight solutions. 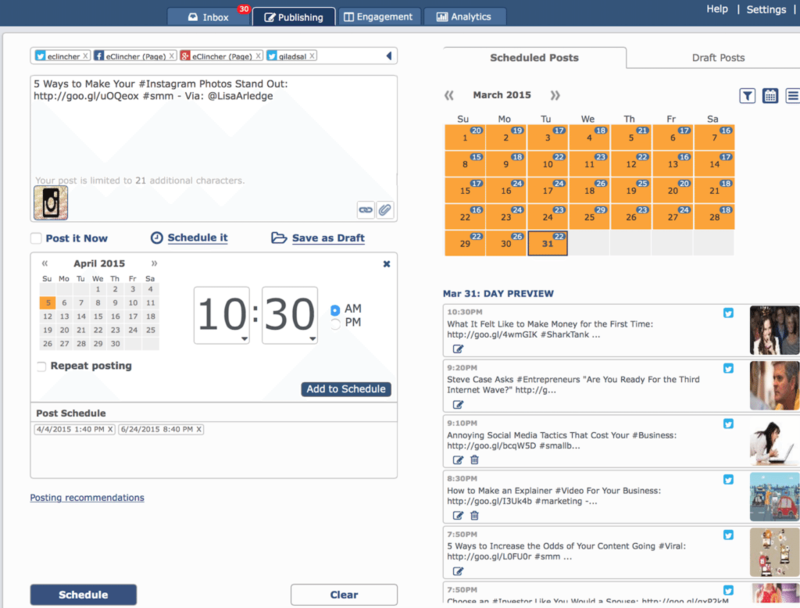 EClincher’s take on visually managing multiple social accounts via a columnized card view is new and organized. This design is similar to a tool called Trello, which Inman uses to manage editorial projects. EClincher’s scheduling tool is visually condensed, allowing for post creation, monthlong calendar looks and by-network post tracking to be accessed in a single screen. You have all the info you need to create a series of posts — or just one for later tonight. A powerful eClincher feature is found in its analytics capability. The solution’s programmers have a history in analytics, so it’s no wonder this offering is addressed so intelligently. For example, if you find that last month’s blog post on home staging has garnered 50 percent more shares on Facebook, you can choose “Repost” directly from the analytics screen to set it up for another run through the socialsphere. This single-button feature is a nice touch of efficiency and puts content decisions right at the point of measurement — a powerful argument for the value of social media marketing. Relative to mobile functionality, I was told that the mobile version of eClincher is set to launch in the next few weeks and will have full functionality. EClincher is a nice break from the many social media management tools that focus heavily on ad and marketing agency accounts. It’s user-friendly but also has some advanced tools that add to its practical feature set. Do you use eClincher — and what do you think? Leave a comment and let us know!